Here we go once more with an episode that has songs mostly picked out by listeners of this fine fine podcast. 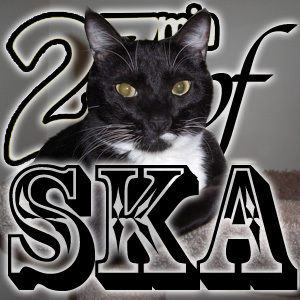 Once again, I’d like to thank my sisters, brothers and others over at /r/ska for being game and filling my head with songs and ideas and my inbox with sweet sweet ska! What’s this? A bunch of songs about the ladies? Hells yeah it is! Go crazy! But, for reals, several odes to women, how awesome they are, how much they are missed and even a few about how they’ve done ya wrong. Oh, and that little guy in the picture, that’s my lil two tone cat Mr. Pants. He’s always tryin’ to seduce the ladies. Oh, that Mr. Pants! This episode and all episodes can always be found here. You can also subscribe to the podcast by going to your advanced tab on iTunes, then select “subscribe to podcast…” and entering this address: http://23minofska.podomatic.com/rss2.xml into the box that opens. Also if you’d like, find & like us on facebook. Get this podcast to go by downloading it. Now that it’s officially Summer it is time to cool off w/ some music and ska ranks right up there w/ lemonade for me a perfect laid back sunny day. The first ska CD I ever got was the Toasters “Dub 56” and a song like “Goody Goody” takes me right back to that day of discovery. Out of all of the songs on that album 2 were left of of the second pressing, “Goody Goody” was one of them and think people should hear it (oddly enough it resurfaced on the 3rd and current pressing of “Dub 56”). Reel Big Fish, it had to be done, I couldn’t avoid them forever, plus I actually like them. I’m no ska elitist. I’m not going to lie, when I first heard this song as “In the Pit” on the “Teen Beef” 7″ I couldn’t believe it was left off their major label debut, hell there’s writing credits for this song in the CD sleeve! Thankfully they left it on the cooker and we got the sweet sweet rockin’ness that is “Thank You for Not Moshing.” Sometimes I’m hard on RBF but they’re still out there making ska, and I appreciate that. The Pietasters are another good example of a band that just doesn’t quit and has made the world better for it. I’ve only gotten a chance to see them once and it was completely amazing! Eastern Standard Time and Spring Heeled Jack were also bands that delivered awesome music that could be blasted out of car windows on warm summer nights. Finally we end with the Pilfers, and you may just question this song. 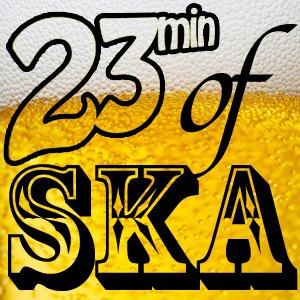 Yes, this song has ska elements galore, and yes, this tune scribbles even more all over the musical landscape than any other song I’ve ever included on this podcast, but in my defense it is an exceptionally excellent song and one that was a constant party mix mainstay for my Moss Ave. Apartment days when I lived with Bryan from the Drunken Zombie podcast. Ska + Too Many Ciders + Summer Nights + Apartment Crowded with Great Friends = “Legal Shot Pam Pam!” I know, the subject matter is dark, but the music is oh so killer! You can also subscribe to the podcast by going to your advanced tab on iTunes, then select “subscribe to podcast…” and entering this: http://23minofska.podomatic.com/rss2.xml into the box that opens. Failing that, you could always just download it. Also, if you figured out this episodes theme then good for you, you’re totally awesome and don’t forget to watch the right.